Because most of the local meat marketed in the area goes through our plant, we’re well-positioned to observe which growers are getting consistent, high-quality results. Likely because of this, we get asked all the time by new farmers for advice on improving their methods to produce great-quality meat. The information you’ll find on this page comes from three local farms, all of them operating year-round to keep our local market supplied with beef, pork and lamb and we’d like to start with some thank-yous. Bruce and Valve Forrest of Forrest Farm raise beef cattle, rabbits and eggs and talked with us about raising grass-fed, grain-finished beef. Peter Brink of Sandy Acres Farm talked with us about his pork operation; he also raises Limousin and Angus beef. Jason Reid of Reidridge Farm helped us understand the lamb industry better; the Reids also breed and sell beef calves to other local farm operations. Our thanks to all of them for their contributions of time and expertise to help us put together the information you’ll find below. One of the most important things we learned from our conversations with Peter, Bruce ,Valve and Jason is that every farmer does things a little differently, sometimes because of personal preference, sometimes because of their production capabilities or property inventory, sometimes as a result of experience or curiosity. The three we spoke with are all characterized by a drive to improve: to raise better meat while at the same time finding ways to reduce their costs and labour. We hope their advice will help you achieve similar results. What are the qualities of really good carcasses? How much should my animal weigh at processing time? How old will it be? I don’t have a scale. How will I know if my animal is a good weight for processing? What should I feed my animal? How much should I feed and water my animal? How fast will it gain weight? 1. What are the qualities of really good carcasses? We see animals of all shapes, sizes, breeds and ages crossing our processing floor and so we understand that there’s a huge variety in the methods that lead to an animal being ready to process. In our experience as both the people who see your meat first and meat-lovers ourselves, there’s one factor that is the most important in terms of flavour and tenderness, and that’s fat cover. Your success at bringing in an animal with good fat cover will be affected by its breed, age, diet and living conditions and will make the difference between meat you can eat and meat you can’t wait to eat. Bruce knows that fat cover is essential because beef must be hung to age for a period of time after processing. This aging process uses gravity and the carcass’ own weight to slowly stretch out and break down muscle proteins, tenderizing the meat in the most natural way possible. The longer a carcass can hang beneath its protective coating without drying, the more tender the meat will be. Jason Reid agrees and says that, although the hanging time is shorter, the same is true for lambs; he calls that layer of fat a natural “Ziploc bag,” keeping your meat moist and juicy while gravity does its job. Not only that, but a good layer of fat makes it easier to remove the hide and preserves the meat beneath from damage during the process, contributing to a better end product in multiple ways. Like lambs, pork hangs for less time than beef. Peter Brink looks for the perfect amount of fat on his market hogs; enough to give good hanging time, to melt generously into slow-cooked pork shoulders and pad out the bacon, but not so much that it represents a lot of wasted feed or results in meat that shrinks significantly when you cook it. Fat cover is the most important factor in really good meat. Read on to learn a little about how these farmer achieve it. 2. How much should my animal weigh at processing time? How old will it be? Owing to the variety of cattle breeds being raised in the area and the different ways they’re raised, it’s actually difficult to set a standard for an ideal weight. We see everything from small Dexter cows to larger breeds like Charolais and Limousin with a big range between. Bruce Forrest’s Charolais beef walks in weighing between 1,000 and 1,500 lbs, a range he’s decided is optimal for feed to gain ratio and customer satisfaction. Their age at this time depends on whether or not they’re backgrounded before they’re grain-finished. If they go straight to finishing, they tend to be ready between 12 and 18 months; if given that extra time on pasture they’ll be closer to 24 months. Visit the Ontario Ministry of Agriculture, Food and Rural Affairs, canadianbeefbreeds.com or cattle.ca for specific information on differences between breeds and plan your process accordingly. Market hogs, both locally and in the national market, tend to be processed at about 6 months of age. At that time they’re about 275 lbs live-weight and yield a hanging weight of 225 lbs. This figure changes for heritage breeds, which don’t convert feed as efficiently and have a slower rate of growth. Jason Reid raises his lambs for the local market to a live weight of about 90 lbs, which results in a hanging weight of about 45lbs. Depending on the breed lambs can take significantly longer than his do, but his lambs are about 7 months old when they are ready for processing. 3. I don’t have a scale. How will I know if my animal is a good weight for processing? Although it’s not 100% accurate, farmers have been using the “taping” method of estimating livestock weights for hundreds of years. To tape your animal, you’ll need a marked string or a measuring tape (a tailor’s tape works great) and either a handling squeeze (a narrow stall that can be closed in at both ends, holding the animal still while allowing you access from the side) or a very good distraction like treat food to keep your animal occupied while you measure. Keep in mind that if you’re aiming for really good meat your biggest concern is good fat cover – an older animal may have a larger frame and measure larger but not have good fat cover. Hogs can be measured this way to an accuracy of 3 or 4 percent. Using the measurements from steps 1 and 2, calculate body weight using the formula HEART GIRTH x HEART GIRTH x BODY LENGTH / 400 = ANIMAL WEIGHT IN POUNDS. Example: your heart girth is 42 inches, your length is 45 inches. 42 x 42 x 45 / 400 = 198.45 lbs. 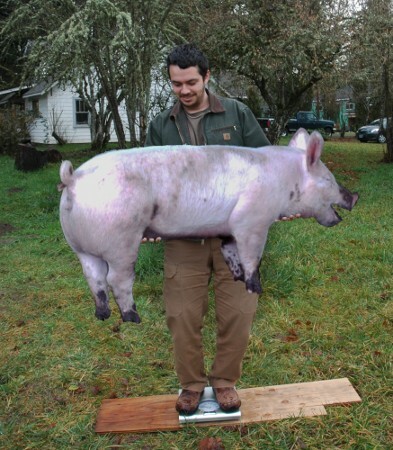 If you’re aiming for average market weight, this hog has about 75 lbs to go before slaughter. Note: If the hog or sow weighs less than 150 lbs., add 7 lbs. to the final answer. For example, if you have a young hog whose total body weight you have calculated to be 125 using the formula above, use the formula 125 + 7 = 132 lbs. Cattle can be measured in a similar way, except the length is measured on the diagonal across the animal’s flank rather than down the back; the equation is slightly different. Measure the circumference of the animal, as shown in “distance C” in the illustration. Make sure to measure girth in relation to the location of the animal’s heart. Measure the length of the animal’s body, as shown in distance A-B in the illustration. Using the measurements from steps 1 and 2, calculate body weight using the formula HEART GIRTH x HEART GIRTH x BODY LENGTH / 300 = ANIMAL WEIGHT IN POUNDS. Example: a beef cow has a heart girth equal to 70 inches and a body length equal to 78 inches. 70 x 70 x 78 / 300 = 1,274 lbs. Taping lambs tends to be a little trickier than hogs or cattle because of the puffy coat. In our conversation with Jason Reid, he told us that sheep and lambs are more “hands-on” – literally – than beef or hogs because you can’t see their bodies; in order to gauge an animal’s fitness for market you need to be able to feel its muscle development through the wool. Jason says market-ready lambs are “square,” explaining that when you feel their bodies beneath the wool, finished lambs will have wide, flat backs and you won’t be able to feel the knobs of their spines – hence the “hands-on.” If you’re already doing this, taping may be a natural next step for you anyhow. Measure the circumference of the animal, as shown in distance C in the illustration. Make sure to measure girth in relation to the location of the animal’s heart. On a sheep, ensure an accurate measurement by compressing the sheep’s wool so that the circumference reflects that of the body and does not include that of the body plus the wool. Example: a lamb has a heart girth equal to 30 inches and a body length equal to 28 inches. 30 x 30 x 28 / 300 = 84 lbs. 4. What should I feed my animal? Whether you’re raising ruminants like cattle and sheep or omnivorous hogs and whether you’re raising on grass, grain or garden veggies, the right diet is one of the three “ingredients” our three experts agreed would make or break your success. Earlier in their lives, animals need a larger amount of protein in their diets to build their bodies to adult size. In the final few months, though, a high-carbohydrate diet is essential for building the fatty tissues that make the difference between meat you can eat and meat you can’t wait to eat. Sheep are exceptionally sensitive to copper poisoning and commercial rations are always balanced to ensure very low amounts of copper, which appears in higher concentrations in other animals’ feeds. Never substitute another animal’s diet for sheep or lamb feed. First, your pasture needs to be full of the right kind of plants. If your cattle or sheep are dining on thistles and burdock, they won’t be getting what they need to grow healthy and strong. You can have your pasture tested for nutrient content and solve your deficiencies by overseeding with additional grasses or by supplementing your animals’ diets with grain. Second, even if you’ve done a fantastic job of overseeding pasture with delicious and nutritious grasses, once fall arrives those grasses turn brown and become low-carb, low-nutrient straw: not a good food source. If you’re following a traditional model and raising animals outdoors through the summer in preparation for fall processing, this means your animals aren’t going to get the high-carb diet they need to build that fat cover; in fact, if you aren’t supplementing their diet at this point, consuming dead pasture will actually cause them to lose the weight they’ve put on in the months previous, costing you pounds at exactly the time you should be seeing your animals become rounded and delicious. This is a big area of concern for lots of local growers who want to enjoy grass-fed beef or grass-fed lamb, but don’t sweat: you have options. Jason and Bruce each hold a portion of their juicy summer grasses in reserve to help finish their animals, ensuring that they have access to high-carb, high-nutrient hay or silage in the fall and winter months when our local grasses have finished their summer cycles. For small farmers, however, this can be out of reach. If you don’t have the scope or the scale to be cutting hay yourself and if you’re looking to finish your beef or lamb on grasses alone, consider teaming up with a local dairy farmer and asking them to supply you with high-quality hay, haylage or a high-carb feed like corn silage or cull potatoes to offer your animals once their pasture starts turning brown. Both Jason and Bruce use grain in their finishing diets, supplementing with lots of clean straw which becomes both bedding and a source of dietary fibre for the animals. Bruce’ cattle enjoy free access to minerals and good quality hay or haylage as well as a measured grain ration as they finish. Jason tells us that by the time they are market age his lambs have been moved entirely to a grain/straw regimen and are no longer eating pasture grasses at all. For smaller operators without the ability to grow their own grain, Jason suggests talking with your feed supplier about bringing in a ration balanced specifically for finishing lambs – most feed mills supplying our area have nutrition experts on staff who can help you determine your animals’ ideal diet based on the quality of your forage and your finishing goals. Throughout history, pigs have been known for their ability – and willingness – to eat pretty much anything you put in front of them. Just because they will, however, might not necessarily mean they should, if you want a delicious-tasting product. “Garbage in, garbage out,” Peter Brink commented when we asked about feeding hogs on leftovers and grocery reclaims. Although this can be a cost-effective way to raise pork, it doesn’t always result in the most delicious product. Peter, who raises a great deal of his own grain on the farm at Sandy Acres, works with an animal nutritionist to maintain his own custom blends of feed balanced for each stage of his hogs’ life-cycles, and brings in grains and minerals from the feed store when he needs additional ingredients. If you’re not at the stage of growing your own grain, you can achieve results similar to Peter’s by purchasing hog feed from the feed store, which offers blends specifically engineered for different stages of your hogs’ lives. 5. How much should I feed my animal? How fast will it gain weight? Much like the answer about cattle weights at processing time, this is a complex thing. All of our producers talked about environment and water as part of this equation. Rather than controlling their feed bill by feeding their animals less, our three experts encourage plentiful diets and promote healthy metabolisms, which keeps animals content and encourages their development in as efficient a fashion as possible. The short, simple answer may be: feed your animals as much as they want to eat. Bruce and Jason are firm believers in the free-choice method, allowing their animals free access to their feed. “Their bellies are always comfortably full this way, so they don’t gorge, ” Jason told us. “The larger ones aren’t trying to protect their food supply, so they don’t push the smaller ones away from their feed.” This actually optimizes feeding habits; all of the animals can eat as much as they need, and don’t tend to overeat. Bruce, Peter and Jason all described the way animals will eat less if they don’t have fresh, clean water to wash down their feed, or if their feed bunks aren’t kept clean. “If it smells like spoiled food, they won’t want to eat it,” Bruce explained, and lower consumption generally means that animals take a longer time growing or, worse, lose critical ground on the growth curve when they’re developing the metabolism that will let them convert feed efficiently and finish properly. “Well-bedded is half-fed:” Control your animals’ environment, control your feed costs. Bruce also talked about the conditions in which animals are kept, describing the way a cold, wet cow will burn energy keeping itself warm instead of putting on weight. Cows with lots of manure on their hides will take longer to dry off than clean ones, contributing to issues of health and feed conversion. Now imagine all the calories evaporating while the neighbour’s dog is chasing your pastured animals in circles. Keeping your animals calm, content, well-fed and well-watered won’t just contribute to their physical and mental well-being, it can also keep your feed costs down. Bruce told us that he estimates that he will feed between 1 and 1.5 lbs of supplemental grain per 1 lb of body weight gain while he’s finishing his beef, but some breeds require more and others require less. Can we provide an estimate of the quantity of feed a market steer will have consumed in its lifetime? Peter says that, throughout a market hog’s life – keeping in mind that Peter breeds white F1 sows to Duroc boars to produce market hogs which conform fairly well to industry standards – an average of approximately 3.3 lbs of feed is required for every 1 lb of live weight gain. That means that Peter’s 275 lb market hogs will have consumed about 900 lbs of feed by the time they’re ready for processing. This figure doesn’t often go down, but it can definitely go up if he buys a new jacket. Jason, Bruce and Peter all brought up the subject of parasites, which can have devastating effects on an animal’s health and lead to increased feed costs, losses and even animals being condemned at inspection. Parasites can be prevented in a number of ways; keeping your animals in clean conditions is one of the most important ones. Not only will dirty feed bunks turn your animals off their feed as Bruce advised above, they’ll attract flies, rats and other pests which carry diseases and parasites of their own. Keeping your feed and water stations clean goes a long way towards animal health and comfort and reducing your feed costs. Jason also talked about the importance of pasture rotation in parasite management. Because parasites tend to lurk near ground level and cling to vegetation only up to a height of 2 or 3 inches, sheep and lambs should be grazing on pasture taller than that to prevent them from being infected, and should be rotated out before grass gets cropped that short. In addition to describing them as really “hands-on” animals, Jason Reid cautions that sheep and lambs have delicate constitutions. Not only are they susceptible to copper poisoning – beware of feeding sheep other animals’ feed as they may be too high in copper and result in sickness or death – a sickness in a single animal is often just the precursor to a sickness in the whole flock. Jason says they’ve learned that when a single sheep gets sick the first step is to identify the cause and immediately move to prevent the rest of the flock from falling ill, because the initial case will probably not recover. Prevention is key to their health. Bruce spoke specifically about beef cattle, but his advice is sound for any species of domesticated animal: group your animals by size whenever possible. Even if you’re offering your animals free-choice feeding, larger animals will bully smaller ones and this can result in herd/flock upset, poor eating habits and even injuries.